Thanks for the lovely comment, Leann. It’s nice to hear I’m not the only one in the Kevin Brown Fan Club. No thanks needed here. He is a great guy, great dad, a wonderful grandfather (Bobo to an army of little ones!) and as far as ex husbands go, a great friend to me. We’d all be lost without him. It’s so wonderful to see him finally get noticed for some of the beautiful things that he does. The best part is that he doesn’t even do things to be noticed. He does them from his heart, because he is just a true blue guy. A rarity these days. I’m so happy that others are getting the chance to sample some of his goodness. He is a very talented man. 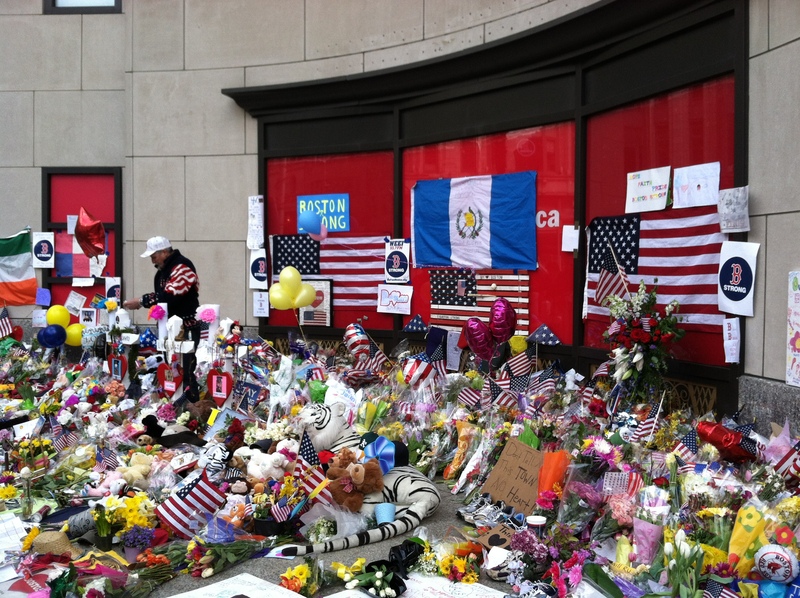 You are all doing a great job on the memorial. Keep up the good work! Cataloging is a very daunting task, one I find difficult, especially one as emotional as this, and at times the job itself can be tedious but it is so important. BRAVO to all involved! My pleasure, Kevin–you earned it. I followed the link off your comment on my piece on History@Work (thanks for that) and read your posts here with great interest. As may be clear from my article, I’ve been struggling with what this all means and how we remember atrocity, especially when it’s this close to home. 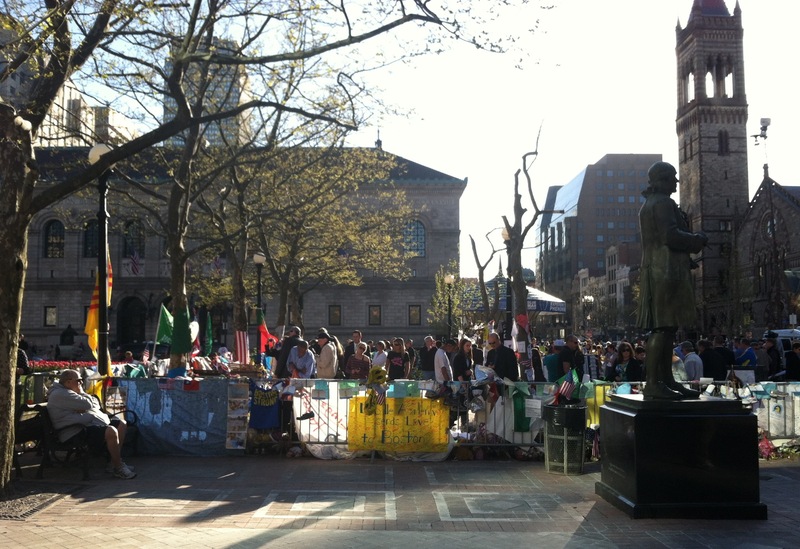 Like most in Boston, I’ve never been this close to atrocity before, and I am occasionally still shocked by the fact that bombs exploded in my city. 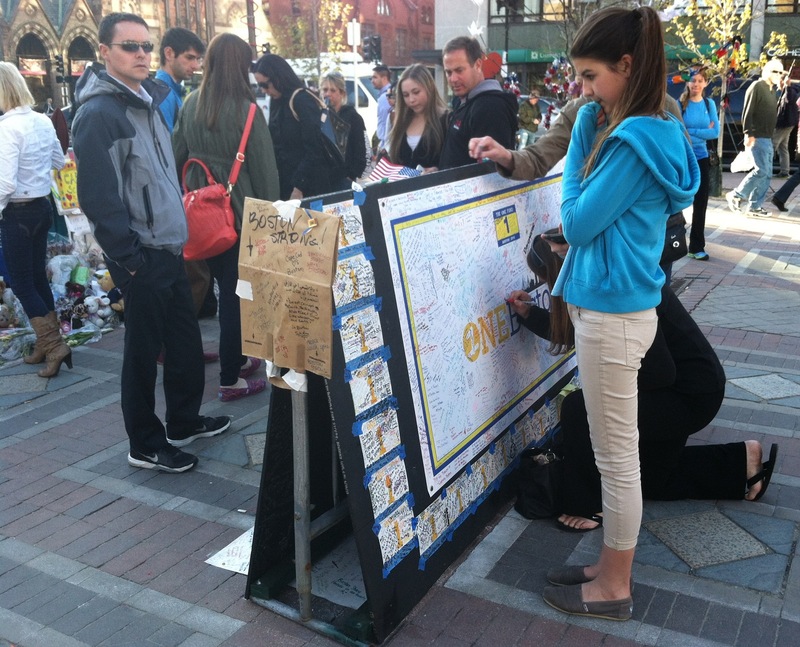 I was struck by your suggestion of “a thoughtful, compelling, and flawlessly executed exhibition of this material on the one-year anniversary of the bombings—to help Bostonians process their emotions and memories and transform them into some sort of positive civic engagement for the city.” I’m not sure this is what is needed, though I speak for myself only. It seems to me that this entire Boston Strong meme has taken over pop culture in the city, and the Bruins, especially, made use of and capitalised on that (for the team’s own interest as much as civic engagement) in its run to the Stanley Cup Final (http://spatialitism.wordpress.com/2013/06/25/boston-strong/). But perhaps more importantly, the Marathon will have its 118th running next 15 April, and there will be thousands of people there attempting to reclaim Boylston St., the finish line, and the city itself. The Marathon is a major event in the city, as you know, and, when combined with the Red Sox traditional game that morning, you’ve got these two ready-made traditions which, I’m sure, Bostonians will take hold of and make use of for processing their now year-old emotions. I realise that not all Bostonians are sports -men and -women, but I do really think the Marathon itself will do the job of the sort of exhibition you propose. Anyway. Just my two cents. I certainly understand where you are coming from, Matthew, and you’re right, participating next April in the marathon itself and the Red Sox game will be extremely important ways that people remember and make meaning from the bombing, collectively. But I have a concern that it will be very easy around the time of the one-year anniversary, through social media and news coverage, for everyone’s emotion about this event to get whipped into a frenzy and then be left hanging there in the air with nowhere to go. 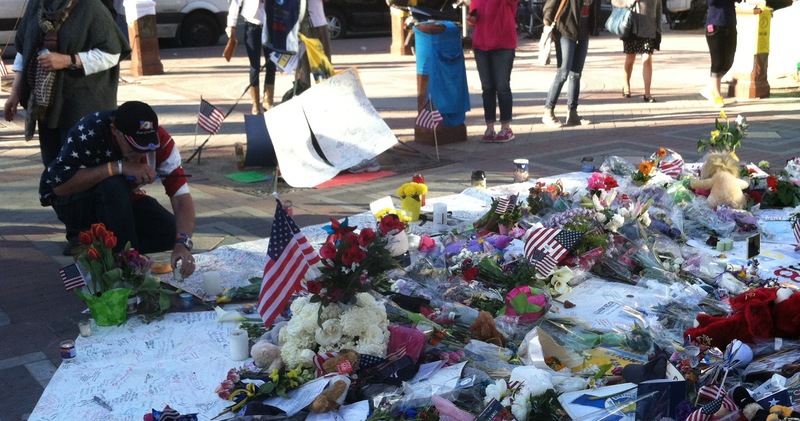 In the face of an event that touched so many so deeply, I think it’s likely people will need additional civic rituals besides these two alone, additional ways to connect, commemorate, and participate that produce catharsis and a sense of larger purpose. I believe that civic institutions like museums and libraries can provide a public service by offering places for reflection, by digging deeper into the story and what it means, by bringing people together for thoughtful public dialogue, and by channeling all that emotion into some lasting sense of civic engagement. 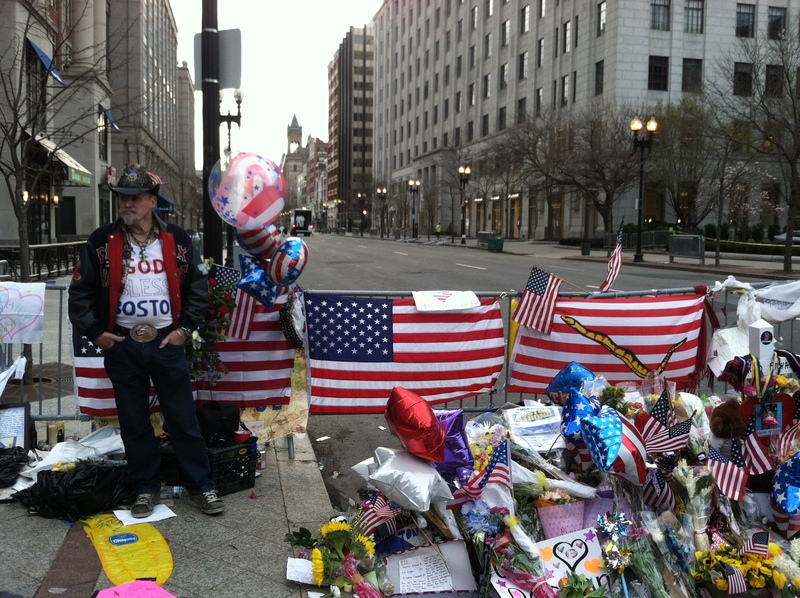 In terms of the public dialogue, by the way, we’re hoping to hold a series of town hall meetings to discuss big issues the bombing raises, among them immigration and religious tolerance, do we want secure cities or open cities, and in this moment of great tragedy, what’s the best version of Boston we could create together, to serve as our silver lining? I guess the question comes down to what commemoration is and what it looks like. 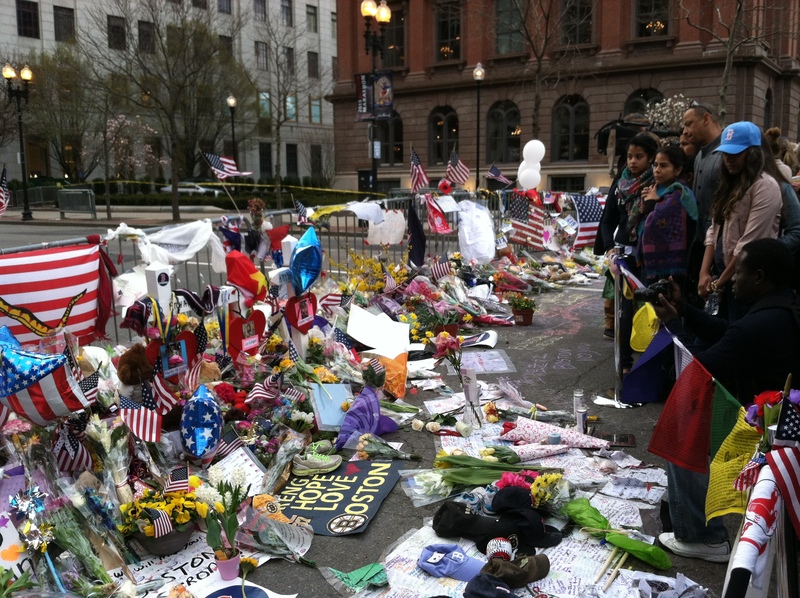 My initial point was that the insta-commemoration, like that on Boyolston/Copley Sq shouldn’t be dismissed lightly, as it seemed to me people and academics were. But I do think there should be space for something, but what that is, I don’t know. You noted that those running shoes are forever altered, even if they’re in a box in an archive somewhere. I agree, to a point, but I fundamentally believe that the shoes, the caps, the what-have-yous at the memorial are shorn of their meaning and import in those boxes. I think the Boston Public Library should be the location for a commemorative exhibition, the library, the museums, etc., yes, they do provide that public service. My hometown, Montréal, is particularly good at that. The public fora sound interesting. Such a complicated set of issues, with questions reaching out in all directions. Thanks for the thoughtful back-and-forth. And by the way, Montreal is one of my favorite cities–I was just there last month.